In this interview, Julie Verlaine, an expert on cultural history, discusses her specific experience as a historian exploring a world that was also studied by a sociologist. Indeed, Verlaine focused on the post-war art market in Paris, wich was studied in depth by the sociologist Raymonde Moulin in the 1950s and 60s. Moulin’s research was published as a book, Le Marché de la peinture in 1967, which has since become a key reference in the sociology of art and was translated in English in 1987 [The French Art Market. A Sociological View]. Fifty years later, Verlaine focused on this same world, but from a different disciplinary perspective. The resulting book, Les Galeries d’art contemporain à Paris de la Libération à la fin des années 1960, was published in 2013. What was the role of the sociologist’s work in the historian’s work? What does this dual disciplinary perspective contribute to our knowledge of the art market? What are the scientific and theoretical issues involved in the transformation of a sociological study into a historical source? Dans cet entretien avec Julie Verlaine, spécialiste d’histoire culturelle, on revient sur une expérience de recherche singulière - celle d’une historienne explorant un monde passé qui fut étudié, en son temps, par une sociologue. Dans ce cas, il s’agit du marché de l’art parisien après 1945 : en effet, ce monde fut d’abord le lieu d’une longue enquête de terrain menée par la sociologue Raymonde Moulin, dans les années 1950-60 ; le résultat en fut son livre - devenu un classique de la sociologie de l’art - Le marché de la peinture, paru en 1967. Cinquante ans plus tard, c’est à ce même monde que Julie Verlaine s’est intéressée, depuis une autre discipline ; le résultat en fut son livre Les galeries d’art contemporain à Paris de la Libération à la fin des années 1960, paru en 2013. Quelle place a pris le travail de la sociologue dans celui de l’historienne ? Qu’apporte à la connaissance du marché de l’art, ce double éclairage disciplinaire ? Quels enjeux théoriques et scientifiques implique la transformation d’une enquête sociologique en source historique ? En esta entrevista con Julie Verlaine, especialista de historia cultural, abordamos una experiencia de investigación singular – la de una historiadora explorando un mundo pasado que fue estudiando, en su tiempo, por una socióloga. En este caso, se trata de un mercado de arte parisino tras 1945 : en efecto, ese mundo fue, primero, el lugar de un largo trabajo de terreno llevado a cabo por la sociológica Ramonde Moulin, en los años 1950-60 ; el resultado fue su libro – que se convirtió en un clásico de la sociología del arte – Le Marché de la peinture, publicado en 1967. Cincuenta años más tarde, Varlaine se interesó a ese mismo mundo desde otra disciplina ; el resultado fue su libro Les Galeries d’art contemporain à Paris de la Libération à la fin des années 1960, publicado en 2013. ¿ Qué espacio tomó el trabajo de la socióloga en el de la historiadora ? ¿ Qué aporta al conocimiento del mercado del arte este doble enfoque disciplinario ? ¿ Qué preguntas teóricas y científicas conllevan la transformación de una investigación sociológica en una fuente histórica ? 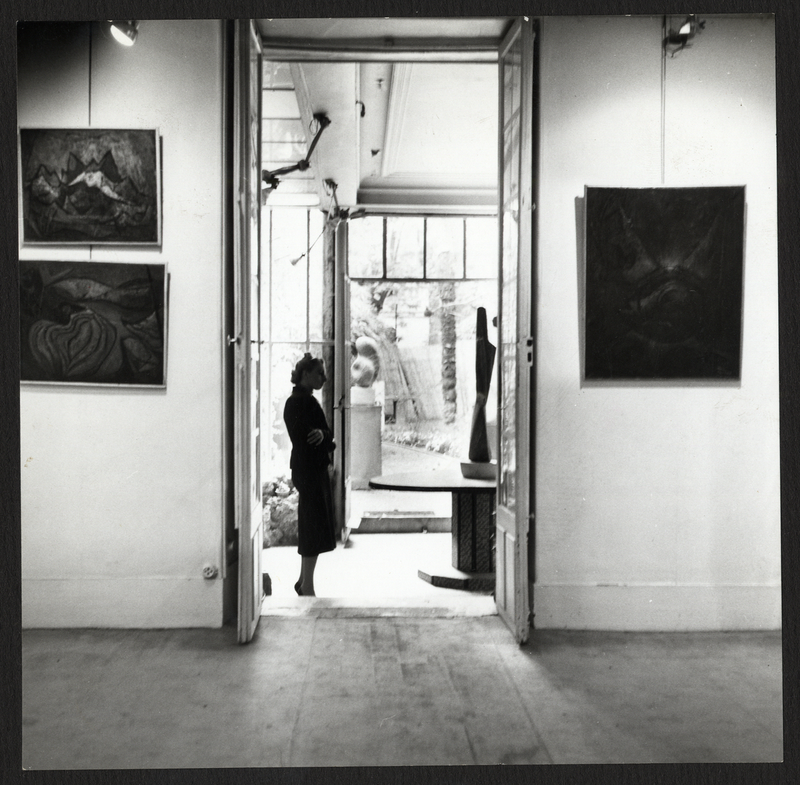 At Galerie Colette Allendy in Paris, in the 1950s. Source: Galerie Colette Allendy Collection/IMEC. © Margo Friters-Drucker. Séverine Sofio (S. S.): – You are a specialist in cultural history. Could you start by briefly introducing this speciality within French history? Julie Verlaine (J. V.): – Cultural history originates, on the one hand, from the “history of mentalities,” introduced by Georges Duby and Maurice Agulhon, and, on the other, from political history, as it was revisited in the 1990s by scholars such as Pascal Ory and Jean-François Sirinelli, following René Rémond. It is the encounter between these two historiographical traditions that led to the emergence of what we now call “cultural history.” It is a social history of collective representations and sensitivities: its goal is to retrace the history of actors and bearers of collective representations, which we group under the umbrella term of “culture” (by which we mean, implicitly, “common” culture). It entails the study of ideas and objects, of both “popular” and “elitist” culture. Its main focus lies in social norms and value systems (what is beautiful/what is ugly, what is pure/what is impure…), and, in particular, in taste and the imaginary: how are these constructed, passed on, contested, and reinvented? Finally, cultural history gives priority to the producer, rather than to what is produced. In other words, cultural history studies individuals and structures, activities and policies, discourses and ideologies, rather than artworks themselves. In France, historians as diverse as Daniel Roche, Roger Chartier, Christophe Charle, Dominique Kalifa, Pascal Ory, and Pascale Goetschel align themselves with cultural history, or have done so in the past. J. V.: – Cultural history is, first and foremost, a social history: the dialogue with other disciplines within social science is part of cultural history’s DNA, simply because we all share an interest in the same topics. In fact, since I work on art galleries and the art market, I am often introduced as an art historian. That being said, I am almost never introduced as a sociologist. This is strange, after all, because in my methods and in the way I deal with art as a subject of investigation—which entails putting aside notions of genius or the idea of an artwork having an intrinsic value—I often consider myself closer to sociologists than to art historians. More broadly, over the past few years, quite a few historians have started saying that they study the cultural history of something (the cultural history of the political, of gender, of the economy…) and several university posts are now entitled “social and cultural history of (such and such a topic).” Actually, I believe this shows that the perspectives opened up by the history of representations, which had long been confined solely to the field of culture, have now been imported into various other study fields. We are witnessing an expansion—and perhaps even a dilution—of the objects that make up cultural history today (culture, representations, the imaginary, and so on). Yet, it may be worth recalling its methodological principles, especially its very strong attachment to the methods of social history and, more generally, social science (interviews, statistics, participant observation, and so on). S. S.: – Your PhD thesis focused on the history of art galleries in France between 1945 and the 1960s. This topic had already been the subject of a large-scale study by sociologist Raymonde Moulin. After having obtained the agrégation1 in history and enrolled as a PhD student in sociology under the supervision of Raymond Aron in the 1950s, Raymonde Moulin began her inquiry on art galleries. Her thesis, Le Marché de la peinture en France, was published as a book in 1967 by Éditions de Minuit2, as part of the collection edited by Pierre Bourdieu, who was her colleague at the Centre d’études sociologiques at the time. Moulin’s research, which was groundbreaking in many respects (we will return to this), is thus doubly interesting for you as you go back to study the same subject fifty years later: with this in mind, has The French Art Market been a historical source for your work, or a sociological inquiry to use as inspiration, and one that you have revisited to some extent from a different disciplinary perspective? J. V.: – I first started reading Raymonde Moulin’s work in 2006, quite early on in my PhD, since, aside from her publications, almost nothing had been written on the art market in France after the war. Moulin investigated art markets, in the plural: she worked on galleries, auctions, auctioneers, brokerage, and so on; whereas my study was limited to art galleries themselves. Other than that, the subject is the same. Moulin’s book is full of quantitative data that are invaluable for a historical study—I definitely made use of that. On the other hand, since all names and interview excerpts have been anonymized, it is hard to use them as factual sources. That said, I drew much inspiration from the typologies she identifies: she had the idea of characterizing her actors through social types, placing not the model of the merchant, but that of the entrepreneur, inspired by Schumpeter, at the core of her analysis. By coming up with some ideal types from observation and interviews, she managed to analyse a social group about which we know nothing other than what she tells us. The main difference between our studies is that, unlike her, I had access to the art galleries’ archives, which had since then been transferred to other institutions, whether public (the Kandinsky Library at the Centre Pompidou or the French National Archives [http://www.archives-nationales.culture.gouv.fr/]) or private (the Institut Mémoires de l’édition contemporaine). My aim was to bring together a quantitative approach (identifying all existing art galleries in Paris, their address, and their exhibition programme, as well as studying their activities with the help of a database) and a qualitative approach based on case studies, which was made possible by the recent accessibility of archives (which, much to my regret, were mostly artistic and administrative archives, rather than economic ones). But I drew extensively on Raymonde Moulin’s methods, and I feel that I have asked the same questions she asked of that microcosm of cultural actors in the post-war period: why is there an art “market”? What kind of relationships do the various protagonists—artists, dealers, and collectors—have with each other? Is it possible to develop a theory of the production of artistic value starting from the observation of this social environment? Incidentally, I have had the chance to meet some of the actors and witnesses to whom Moulin spoke fifty years earlier, such as Jean-François Jaeger, Denise René, and Maurice Garnier, and, on those occasions, I partly referred back to the semi-structured interview guide she included at the end of The French Art Market. S. S.: – Besides this interview guide, as a historian, what did you take, or adapt, from Moulin’s sociological inquiry? J. V.: – Her research methods were extremely innovative. Raymonde Moulin was the first sociologist to tackle the contemporary art market, so she had to innovate in many respects. Her methods and her research questions often lie between history and sociology: we must bear in mind that she was a historian by training, and that, alongside her research on the art market in Paris, she was working on art exhibitions in the provinces in the 1880s. What I especially appreciated and retained from her methodology, besides rigour and sensitivity to nuances, were her examples of mixed methods: for instance, she managed to combine quantification and oral inquiry. She also faced some serious challenges: she was the first scholar to study artists as a social group, thus making an important scientific contribution by quantifying and identifying a population with fairly fuzzy boundaries. In her books, she also has the courage to say that this social environment—the art market and, more broadly, the contemporary art world—is filled with taboos, a lack of transparency, and malpractice. She carried out “non exclusive attendance” (“fréquentation sans exclusive” to use her expression) of galleries, art fairs and exhibitions, auctions, and so on, with the idea that researchers need to have a perfect knowledge of their field, and must integrate to the point of mastering all the codes, even the most implicit ones, without losing their critical outlook, of course. The art market is among the most codified and exclusive environments, which makes this “immersion” quite hard. I encourage my students to take her study as a model and draw inspiration from it. Finally, her book is a perfect illustration of how we can draw general conclusions based on an inquiry into individual lives. She studied the art market by focusing on people first. What interests her are individuals, their initiatives and conceptions, that is to say (long before Howard Becker theorized it) the chain of actors who, within the same field, contribute, each in their own way and from different positions, to the construction of value. From there, she was the first to ask questions such as: what makes success? How does economic success influence an artist’s creation? And so on. Questions that are now the very founding principles of the sociology of art. Moulin’s fascination with Van Gogh led her to these questions: in Van Gogh’s letters we see to what extent his dependency on the market influenced his creation. This is a new phenomenon that dates back to the 1880s at the earliest: from then on, the market became a condition of contemporary creation. A new system was put in place. S. S.: – However, there are some differences between historical and sociological approaches to the same subject. Take for example the anonymization of sources you mentioned earlier: that is one of the clearest differences between the two disciplines. For a historian, anonymizing data is inconceivable, whereas that goes (almost) without saying for a sociologist doing fieldwork today. S. S.: – Raymonde Moulin’s study of the art market, which has been republished several times (although, strangely, never in paperback), has become a veritable model: she laid down the methodological bases and the theoretical questions for all future studies on this topic. We must bear in mind that, at the time when Moulin published her book, the sociology of art in France could be summed up by Pierre Francastel’s work, which was still soaked in aesthetics, while the social history of art was in its infancy and had a strong flavour of critical Marxism, after Arnold Hauser’s works. Moulin has thus been the first to apply both qualitative and quantitative methods to analyse the art market, drawing on the economy, history, ethnology and the sociology of organizations. The thing is, precisely because she was borrowing from several disciplines, her methodology was judged rather negatively by sociologists when her book was published. But what about the small world of art galleries at the end of the 1960s? Do you know how Moulin’s work was received by the people she studied? J. V.: – Yes I do. For instance, Raymonde Moulin theorized the concept of “pilot gallery,” a neologism created by René Berger at the time of the first Salon international des galeries pilotes, which was held in Lausanne in 1963. The idea was to organize a collective event to bring together “modernist” galleries committed to artists, in the fight against the disrepute of painting dealers. At this time, in fact, the term “gallerist” was beginning to make its appearance and replace the term “dealer.” In this context, Moulin gave a great speech on the function of the pilot gallery, defined as an ideal type: she studied how the gallery’s strictly artistic role finds its justification within its role supporting young artists, protecting and promoting talents, and “certifying” the value of contemporary works. I found evidence that, at the time, Moulin’s work was known and appreciated by those dealers who would later create the most famous international shows of contemporary art fairs, especially in Switzerland, with an eye towards the United States. However today, in contrast, the totally pioneering nature of her work, if not her work itself, is relatively neglected or unknown. S. S.: – Do the results of your work differ from those of Moulin’s study? J. V.: – A little. For example, I had to qualify some of Raymonde Moulin’s conclusions, in particular those regarding the role of Paris on the international scene at the time. She dealt with Paris as a microcosm and with Parisian art galleries as a closed system. On the one hand, there are good reasons to do that, but, on the other, this prevented her from seeing broader evolutions, most notably the relations that linked those galleries with others outside of France. She thereby failed to see that the art of that time was already taking place in a transnational space made up of cultural metropolises engaged in constant exchanges, which gave rise to mutual influences, rivalries, and overbids. An international perspective changes the outlook slightly, especially for the study of the first market and the importance of galleries for artists’ careers. We now know that Parisian dealers had been under the influence of dealers in the United States since the 1950s, and that they were very dependent on them. Had her fieldwork not been limited to Paris, Raymonde Moulin would have seen that the hierarchy she was studying was caught up in another hierarchy at the international level, while, at the same time, moving towards dissolution. For example, Moulin fails to see that, if Jean Dubuffet had so much success in Paris, it was mainly because his French dealers were in contact with an American gallerist, Pierre Matisse, son of the artist Henri Matisse, who would sell and give his works to the Museum of Modern Art. In some cases, this prevents Moulin from ascribing the right causes to the effects she studies. Moulin started to consider international aspects later on in her career: she then devoted several essays to globalization and, more generally, to the spatial embeddedness of artistic activities, from the local to the global scale. Another point that Raymonde Moulin has not explored at all (but I should emphasize that this is a very minor point compared with everything that her works have contributed to the field!) is the question of taste and aesthetics. She places the binary opposition of figurative/non-figurative art at the core of her study, but her history of the market is not a history of tastes, or of the construction of artistic tastes. Of course, this in no way diminishes the importance of her study: one cannot possibly do everything in a single piece of research! Plus, The Love of Art, a study of art museums and their public by Pierre Bourdieu and Alain Darbel (in collaboration with Dominique Schnapper), published as part of the same collection the previous year, 1966, tackled these topics in relation to heritage institutions. As for the art market, these are some of the questions that remain to be explored on the basis of Raymonde Moulin’s work: how do collective representations and norms of taste evolve? How can we explain dealers’ aesthetic choices? How can we draw the link between the functioning of the art market and the construction of taste? Moulin focuses on artists, dealers, their relations, and so on, but she is not interested in artwork as a cultural object, that is as a space of cultural constructions. At least, not as a scholar. In any case, we should encourage our students and colleagues to read and reread her work, as well as the edited volume by sociologists Pierre-Michel Menger and Jean-Claude Passeron titled L’Art de la recherche, a rich tribute from her students to their director of studies. S. S.: – In a recent talk at the French National Library, Pierre-Michel Menger explains very clearly why The French Art Market constitutes a model for the sociology of art. Moreover, Raymonde Moulin joined the French National Centre for Scientific Research (CNRS) at a time when there were very few female scholars; for a long time she remained a lone pioneer in her field; she was a specialist renowned both by professionals of the art market and by artists (regrettably, her interviews with Jean Dubuffet have never been published); she served as the director of the Department of Sociology at the University of Vincennes in the wake of May 1968; as founder and director of the Centre de Sociologie des Arts at the École des hautes études en sciences sociales (EHESS) in Paris; and as a member of the Conseil artistique des musées de France (wich is the committee in charge of artworks’ acquisitions for French national art galleries), then of the Comité d’histoire du ministère de la Culture (History Committee of the Ministry of Culture); she was the first woman in charge of the professional association of French sociologists (known today as the Association française de sociologie), and was later in charge of one of the most prestigious French reviews of sociology, the Revue française de sociologie. Considering all this, we cannot help but think that, if Moulin were a man, she would probably enjoy more professional recognition today. J. V.: – Absolutely. It is true that, compared with the number of scientific articles she has written since the 1960s, she published only a few books. The first was Le Marché de la peinture en France in 1967. After that, she authored or co-authored several reports on artists, architects, and policies in support of artistic creation—but these works have never been published (least of all translated in English) or have remained confidential. It was not until 1992, when Moulin had already retired, that she published L’Artiste, l’institution et le marché, the result of a large study on the condition of artists in France carried out—once again with very innovative methods—by the research team at the Centre de Sociologie des Arts in the 1980s. L’Artiste, l’institution et le marché has been republished several times (in paperback this time!) and remains a key reference in France, despite the fact that the data discussed in it were already somewhat obsolete at the time of its first publication. A little while later, in 1995, at a time when the French art world was undergoing a deep crisis, she published De la valeur de l’art, a collection of her articles. Finally, in 2003, her latest work, Le Marché de l’art. Mondialisation et nouvelles technologies, is a rather short book proving that Raymonde Moulin, who was almost 80 years old at the time, was still up to date with developments in the international art market. She analyses all the new configurations of the market and prepares the ground for the sociological analysis of this world. 1 The agrégation is the most prestigious and competitive teaching exam in France. (1961). “Le marchand de tableau.” Journal de Psychologie normale et pathologique, 3: 309-330. (1963). “Un type idéal, la galerie pilote.” 1er Salon international des galeries pilotes de Lausanne. Lausanne, Musée cantonal des Beaux-arts: 10-20. (1964). “Un type de collectionneur: le spéculateur.” Revue française de sociologie, 2: 155-165. (1987) . The French Art Market: A Sociological View. English translation by Arthur Goldhammer. New Brunswick, N. J., Rutgers University Press. (1969). “Art et société industrielle capitaliste. L’un et le multiple.” Revue française de sociologie, 10(1): 687-702. (1971). “Le multiple et ses propriétés.” Revue de l’art, 12: 75-82. [et al.] (1973). Les Architectes, métamorphose d'une profession libérale. Paris, Calmann-Lévy. (1977). Les Aides publiques à la création dans les arts plastiques: Danemark, Finlande, France, Grande-Bretagne, Italie, Norvège, Pays-Bas, RFA, Suède. Paris, La Documentation française. (1978). “La genèse de la rareté artistique.” Ethnologie française, 8(2-3): 241-258. Translated in English by Jane Yeoman: (2011). “The Genesis of the Rarity of Art.” Art in Translation, 3(4), December: 441-447. (1981). Guide de l’artiste plasticien. Luxembourg, Office des publications officielles des Communautés européennes. [avec J.-C. Passeron et al.] (1985). Les Artistes: essai de morphologie sociale. Paris, La Documentation française. (ed.) (1986). Sociologie de l’art, actes du colloque international organisé par la Société française de Sociologie à Marseille les 13-14 juin 1985. Paris, La Documentation française (rééd. 1998, Paris, L’Harmattan). (1986) “Le marché et le musée. La constitution des valeurs artistiques contemporaines.” Revue française de sociologie, 27(3): 369-395. Translated in English by Michel Vale: (1995) “The Museum and the Marketplace: The Constitution of Value in Contemporary Art.” International Journal of Political Economy, 25(2): 33-62. (1992). L’Artiste, l’institution et le marché. Paris, Flammarion (rééd. 1997, 2009). [avec Alain Quemin] (1993). “La certification de la valeur de l’art. Experts et expertises », Annales ESC, 48(6): 1421-1445. [avec Elisabeth Caillet] (1994). “Sociologie de l’art et musée. Un entretien avec Raymonde Moulin.” Publics et Musées, 5: 100-105. (1994). “The Construction of Art Values.” International Sociology, 9(1): 5-12. (1995). De la valeur de l’art: recueil d’articles. Paris, Flammarion. (2000). Le Marché de l’art: mondialisation et nouvelles technologies. Paris, Flammarion (rééd. 2003, 2009). 2 The book was published in English in 1987 (The French Art Market: A Sociological View. English translation by Arthur Goldhammer) by Rutgers University Press. See Raymonde Moulin’s selective bibliography at the end of this conversation.